I was asked once to play some ukulele-like things on a recording, so I investigated and found out for myself what I had heard spoken of. Yep—it’s true: as a guitarist I was able to use much of what I already knew—the tuning is very similar—it’s the same as the 4 thinnest strings on a guitar, just a few frets’ distance up the neck (the subtle difference is that the string closest to your face is tuned an octave higher than it would be on the guitar). I found an instrument to use, and after learning some new stylish picking hand moves (I borrowed a bit from some old-time mountain banjo styles I like) the session went just fine. These days I enjoy picking it up and knocking things out on it—it has a great punchy, light and high sound when a guitar is too much to work with. The uke is tiny and fun—super dry with almost no sustain. Its size makes it a goodie for kids and people with small hands. Most people would agree that the chords are easier to learn than on the guitar too. If you already know some guitar, the uke should be an easy second instrument for you to pick up. 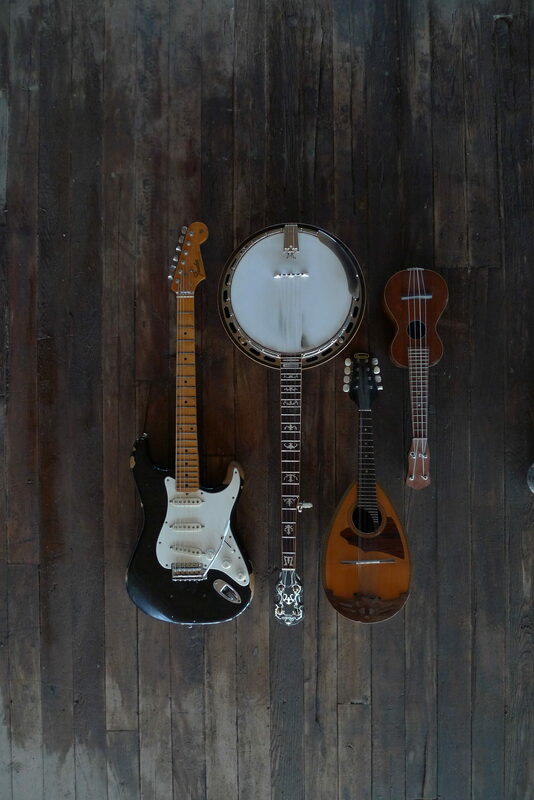 The baritone uke is closer to the size of a guitar made for a young child—it’s huge compared to the more common, tiny one (that one’s called a soprano uke, to be particular about it). The baritone uke is easy to understand as also a fraction of a standard guitar—this one’s also the 4 thinnest strings of the guitar, this time tuned absolutely exactly as they are on the guitar, so all the standard chords and scales work exactly the same on both instruments. The bari uke just has fewer strings. 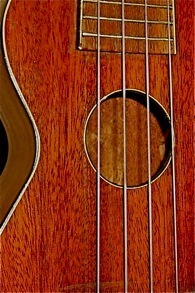 There are other sizes of uke often tuned in a very similar way to the soprano and baritone. If the soprano is too small, have a look at a concert sized instrument. Tenor is the next, then baritone. There’s a lot of music that has happened on the uke. 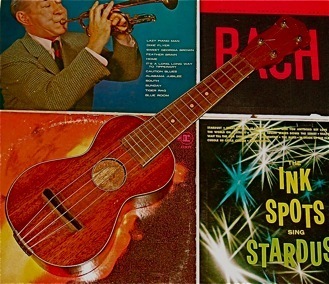 Check out this history page and this one on Ukelele Ike. I’ve experimented with a bunch of different sets of strings on this old soprano uke and have found a set of synthetic gut strings from a company in Italy named Aquila. They’re a tiny bit more expensive than a generic nylon set and they sound and feel great. I got mine from Elderly Instruments’ web site.